Abstract: If you need a silent heatsink, and I do mean silent, the Scythe Zipang is the next best thing to a passive block of aluminum (the only truely silent option). 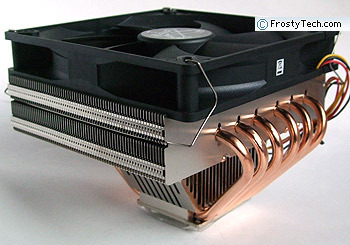 The number one question Frostytech readers ask us is "what's the best silent heatsink?" Much of the time, readers find themselves asking us this question after they've built a media center PC using the standard type of heatsink one normally finds in local computer stores. Those heatsinks almost always prove too loud, or have a distracting whine that takes away from the benefits a home theatre PC affords.... or don't cool well enough. If you need a silent heatsink, and I do mean silent, the Scythe Zipang (SCZP-1000) is the next best thing to a passive block of aluminum (the only truly silent option). Equipped with a 138mm wide fan that spins at a lazy 1000RPM, the Scythe Zipang heatsink stands a moderate 112mm tall with the bulk of its body elevated 55mm above the CPU for good motherboard clearance. 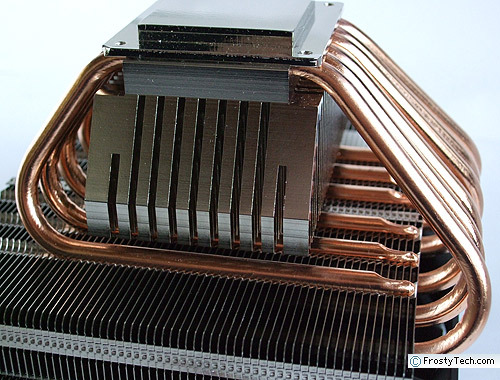 The tightly packed aluminum cooling fins are stacked 145mm across, and the Zipang has no less than six 6mm diameter copper heatpipes threading through, and under its fins. Scythe designed the 815 gram Zipang heatsink to work with all current Intel and AMD processors (775,478,939/AM2), so you can migrate from Intel to AMD or vise versa without having to buy another heatsink. The fixed speed fan has 7 impeller blades and generates no more than 33 dBA according to Frostytech's real world sound measurements. To put that in perspective, a heatsink that clocks in with 35dBA noise in our test environment is whisper quiet. To hear the Scythe Zipang you have to lean in and hold your ear to the heatsink; that makes the Zipang a great option for media and home theatre PCs where low noise cooling is a must... assuming the wide-body cooler will fit. The Scythe Zipang heatsink retails for about $45USD ($45CDN), and is fresh from being introduced at CES 2008! Width is perhaps the only caveat to the Scythe Zipang heatsink. Compact PC cases which have the power supply located too close to the CPU socket may not be able to accommodate this CPU cooler. You'll need at least 68mm of space from the center of the CPU socket for the Zipang to have proper clearance. The other interesting aspect to the Zipang heatsink are its six copper heatpipes. The heatpipes are soldered to the bottom edge of the aluminum fins where heat from the base is first conducted. The other end of the heatpipes connect the base and center of the 30mm thick fins. It's a unique approach Scythe call "Uneven Parallel Heatpipe Construction". We're only left wondering why the heatpipes that thread through the center of the fins are so closely spaced; the heatsink is 145mm wide but the heatpipes have a footprint more like 90mm. Installing multi-socket compatible heatsinks is often a royal pain. With the Scythe Zipang there are just three simple clips which screw onto the base of the heatsink. 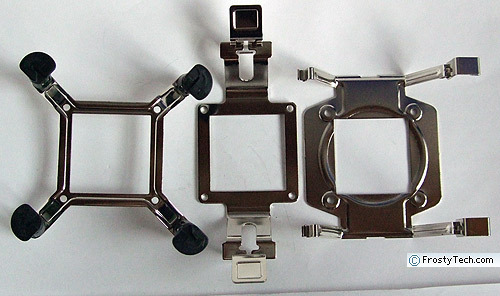 Once clip is for socket 775, another for socket 478, and the last for all AMD K8 processors (754/939/AM2). The clips use tool free retention methods once installed onto the Zipang heatsink. For Intel processors, Scythe rely on the standard Intel push-to-click retention mechanism. For older generation Intel CPUs, we even find a set of brackets for socket 478. All four generations of AMDs Athlon64 CPU are serviced by a springy clip that locks onto the central tab in the heatsink retention frame. 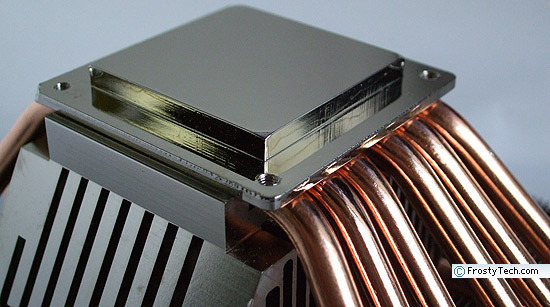 The base of the Scythe Zipang heatsink is made from a machined block of copper which has a heavy chrome plating. The 6mm thick base has a glassy surface finish, with a surface roughness of ~8 microinches. The 37.5x37.5mm base surface is perfectly flat in both axis.